Roy Herbert Thomson, Baron Thomson of Fleet, newspaper tycoon (b at Toronto 5 Jun 1894; d at London, Eng 4 Aug 1976). The son of a Toronto barber, Thomson showed little potential to become wealthy and notable until middle age, when he emerged as the owner of small radio stations and newspapers in northern Ontario. He went on to control hundreds of newspapers in the US, Canada and the Commonwealth, including the Scotsman of Edinburgh (his first large prize) and The Times and Sunday Times of London. He seemed to care little for the romance, tradition and democratic importance of newspapers, running them with the same tightfistedness and quality control he applied to his other businesses (magazines, travel agencies, TV) and for which he was notorious. Quite unburnished in manner and deportment, he was a child of the British Empire in outlook, coveting influence in Britain; at the same time he limited his Canadian holdings to smaller newspapers free of both competition and prestige. By international standards, he was already very wealthy when, late in his career, he diversified into oil exploration. 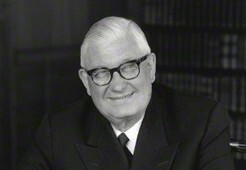 He was created a peer in 1963.